I have a save, which is some ten hours old, in which I have collected every item I have found in the game, and stored this in the castle. Now everytime I try to load this save, the game crashes. I am able to load the game if I first create a new game or load a "safe" save, then load the save with too much stuff in it, but the game will then crash whenever I try to change the area (leave the castle). 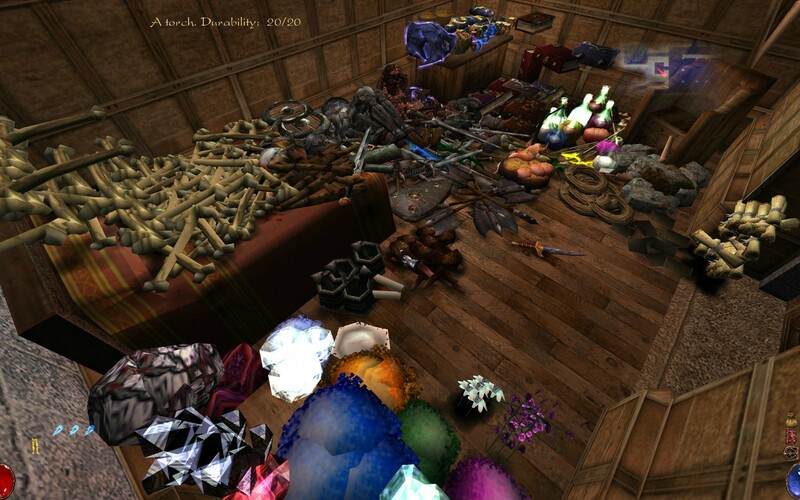 Do this This image is actually somewhat old, since in newer saves the whole castle upstairs is filled with my stuff. Can you please upload the save file causing the crash. Also, could you please submit the crash report using the dialog that (should) comes up after the crash - if you have already done so, please link the report here. The issue was updated with the following change(s): * The milestone has been updated, from '''Not determined''' to '''1.0.4'''. * The custom field OS has been updated to '''Windows 7'''. * The custom field Architecture has been updated to '''amd64'''. The game crashes in unmanaged way, it's Windows saying the 'program stopped working'. It shows no error dialog before or after the windows program crash dialog. I once managed to load the game straight, which in turned made the game run in fullbright. Usually you need to load the save through running another save first. Sorry for the long delay, I was hoping the bug tracker would notify me of any new comments... it didn't. The game crashes in unmanaged way, it's Windows saying the 'program stopped working'. It shows no error dialog before or after the windows program crash dialog. This should be the right save: https://docs.google.com/open?id=0B1M-PV1JIh40UnJLZ1p5TDZ6aWs I once managed to load the game straight, which in turned made the game run in fullbright. Usually you need to load the save through running another save first. Sorry for the long delay, I was hoping the bug tracker would notify me of any new comments... it didn't. Yup, simple buffer overflow as arx doesn't expect to load more than 1500 objects. Should be simple enough to fix. There's that much stuff in the castle? Nice! Thanks for looking into it! I'll hold on to the save until a fix is released. There's that much stuff in the castle? Nice! Thanks for looking into it! I'll hold on to the save until a fix is released. This issue seems to be fixed, at least in 1.2-dev-2016-08-03. Should this still be open? No, the bug is not fixed yet - the save file doesn't crash anymore because we not don't load "destroyed" entities, bringing the number of loaded entities below MAX_IO_SAVELOAD. To fix it properly we need to remove the hard-coded maximum. immediately when loading the referring entity. This has been fixed in the current development code. The fix will be available in today's development snapshot. This has been fixed in the current development code. The fix will be available in today's [http://wiki.arx-libertatis.org/Development_snapshots development snapshot]. The issue was updated with the following change(s): * This issue has been closed * The status has been updated, from '''Confirmed''' to '''Fixed'''. * The resolution has been updated, from '''Not determined''' to '''RESOLVED'''. * This issue's progression has been updated to 100 percent completed.